This multi-purpose passenger vehicle is defined as a Sports Utility Vehicle (SUV). SUV’s have higher ground clearance and a narrower track to make them capable of performing in a wide variety of off-road applications. Specific design characteristics give them a higher center of gravity than ordinary vehicles. An advantage of the higher ground clearance is a better view of the road, which allows you to anticipate problems. They are not designed for cornering at the same speeds as conventional passenger vehicles, any more than low-slung sports cars are designed to perform satisfactorily in off-road conditions. Due to this risk, driver and passengers are strongly recommended to buckle their seat belts. In a rollover crash, an unbelted person is more likely to die than a person wearing a seat belt. There are steps that a driver can make to reduce the risk of a rollover. If at all possible, avoid sharp turns or abrupt maneuvers, do not load your roof rack with heavy cargo, and never modify your vehicle in any way. While a full-time AWD vehicle is raised on a jack, never start the engine or cause the tires to rotate. There is a danger that rotating tires touching the ground could cause the vehicle to fall off the jack and to jump forward or rearward. 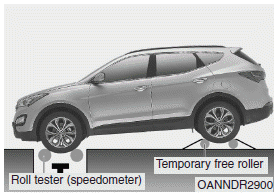 • Full-time AWD vehicles must be tested on a special four wheel chassis dynamometer. 2. Place the front wheels on the roll tester for a speedometer test as shown in the illustration. Keep away from the front of the vehicle while the vehicle is in gear on the dynamometer. This is very dangerous as the vehicle can jump forward and cause serious injury or death.